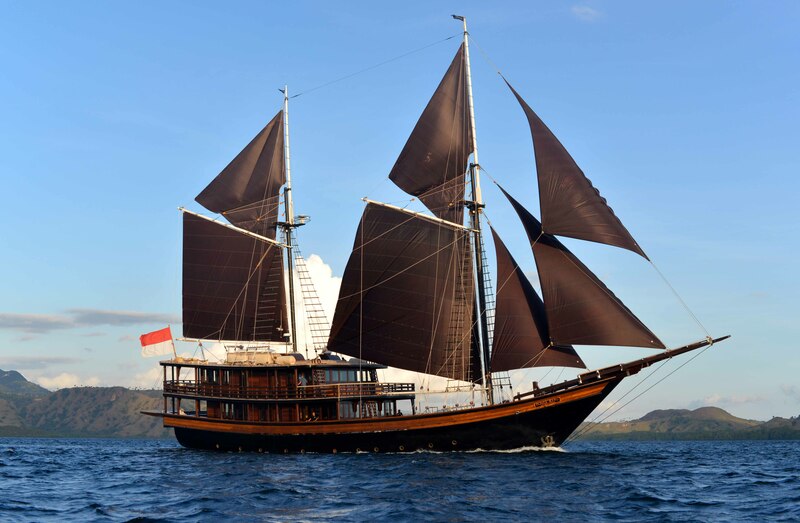 Her looks might be respectfully olde-worlde but Dunia Baru (New World) has brought hundreds of years of Sulawesi shipbuilding traditions to a level of near-perfection. 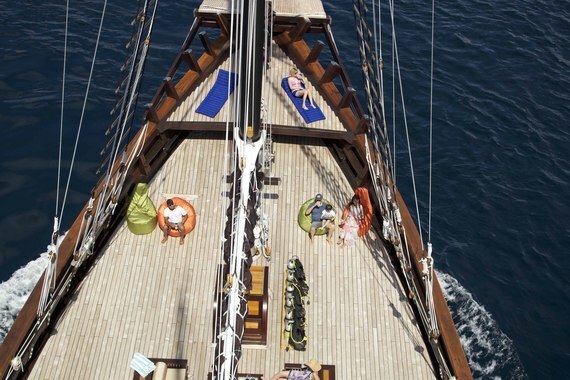 The hot equatorial sun on your back, the cool Java teak deck under your feet and a healthy trade-wind in your sails. 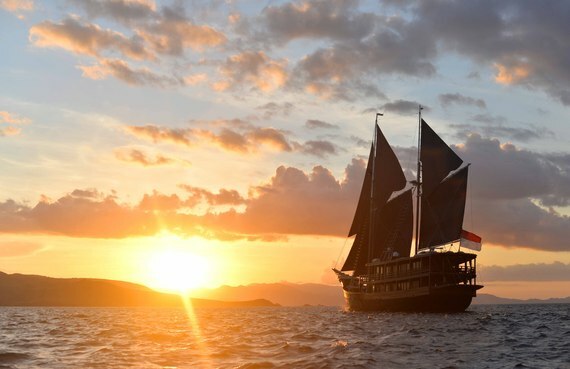 There's no better way to appreciate Indonesia's Komodo archipelago than aboard the recently launched Dunia Baru, the most luxurious traditional ship ever built in Indonesia. Photos by Mark Eveleigh. Her looks might be respectfully olde-worlde but Dunia Baru (New World) has brought hundreds of years of Sulawesi shipbuilding traditions to a level of near-perfection. 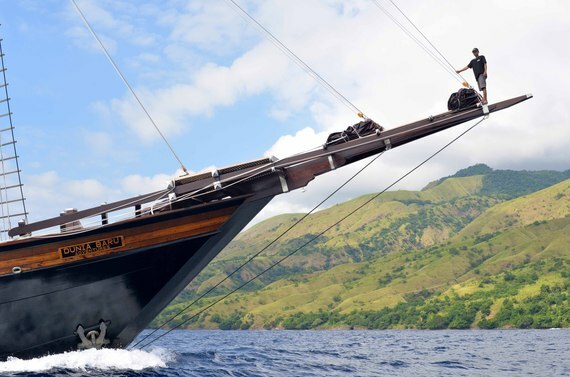 She was built by Konjo shipwrights in Borneo and Bali using the old methods but is rigged and equipped as befits one of the world's most prestigious superyachts. One of the ship's 18-strong Indonesian crew checks out the view from the elegantly soaring bow that is a trademark of Phinisi style vessels. Like the islands that you sail through, getting to know the crew is a crash-course in the incredible diversity of this fascinating country: They hail from five different islands and follow three different religions. 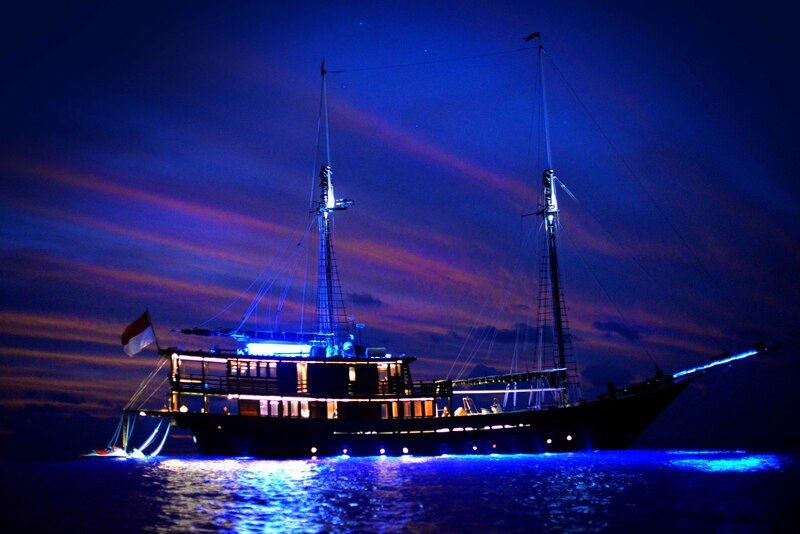 Dunia Baru rests at anchor under the Southern Cross. By the time we'd finished eating at the big open-air table on the aft deck it was dark and the sea was putting on a spectacular display of phosphorescent plankton that rivaled even the great dome of stars overhead. We dove overboard to get a closer look, and were amazed as thousands of otherworldly submarine sparks flickered off the ends of our fingers. Old-time sailors called it "sea lightning." Dunia Baru (New World) was appropriately named. Based in Komodo from April to September and in Raja Ampat (off West Papua) from October to February, she's available for charter to explore some of the most mysterious and least known beaches and reefs in Indonesia's incredible archipelago of 17,508 islands. 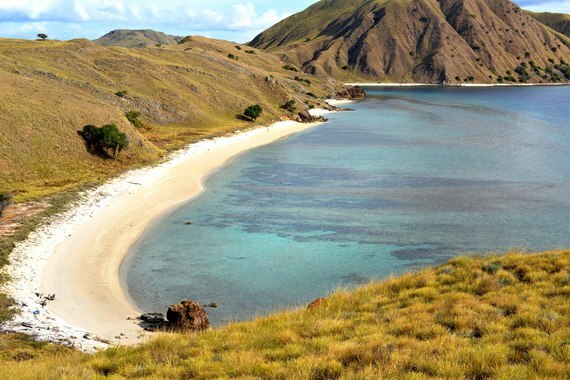 A native of Flores, Captain Syamsudin Riantobi has been sailing Phinisi cruisers and 100-ton cargo ships since he was 15 and the treacherous currents of Komodo hold few mysteries for him. You sail at night and morning sun brings the delightful surprise of a new landfall off an island where the talcum powder beaches rarely see a human footprint. With a maximum capacity of only 14 passengers, the ship has vast areas for relaxing and sunbathing. You can spend days chilling on the deck or go looking for an adrenalin boost diving with manta rays and reef sharks, kayaking or paddle boarding. Or you can take one of the two jet-skis or three inflatable ribs and ride ahead to scout out the next island. Komodo National Park is famous for the dragons, one of Asia's most fearsome super-predators. 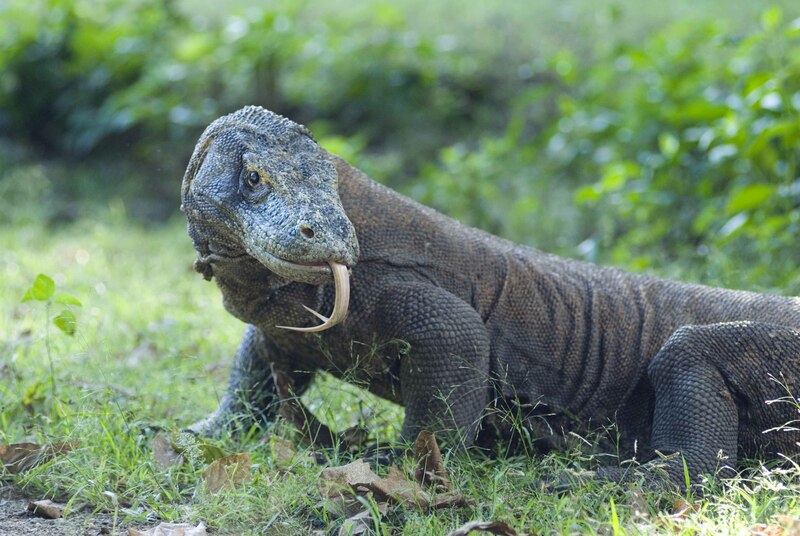 Experts believe that Varanus komodoensis (the world's biggest lizard) may have evolved to such spectacular size -- the biggest recorded in the wild was 3.13 meters long and weighed 105 kilograms -- to hunt a pygmy elephant that once lived in these forests. 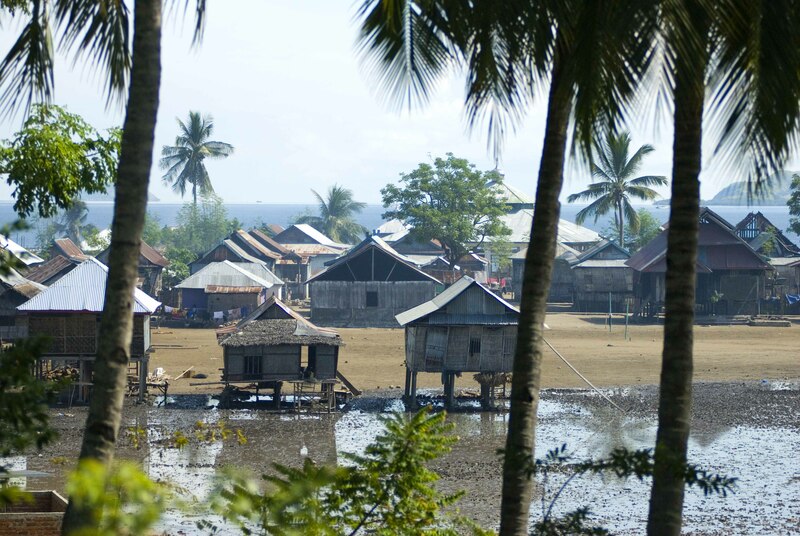 On Rinca Island the little stilted fishing hamlet has become quite literally a village besieged by dragons. The monster reptiles are lured by the scent of drying fish and in recent years attacks on humans have become increasingly common. "We don't leave the village without good reason now," said one old man. "If we need firewood or to collect fruit we go in groups... always armed with sticks and machetes." The Dunia Baru boasts six extremely spacious en-suite double berths, and there is a wonderfully sumptuous full-beam master-suite on the aft upper-deck, with a large bathroom, and a day-bed sundeck. All-inclusive rates to charter the entire ship start from $11,000 per day. NOTE: Mark Eveleigh was invited to travel aboard the Dunia Baru as a guest.